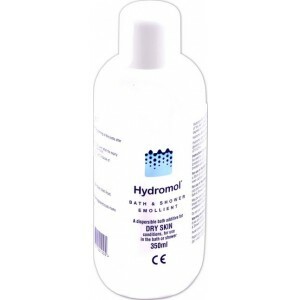 Hydromol is a bath emollient which is used to fortify the outermost layer of skin to lock in moisture. Our UK registered pharmacy are able to dispense and dispatch Hydromol directly to your door via a next-day trackable courier service. To begin your order, press the green button below. What is Hydromol bath and shower? How do I use Hydromol bath and shower? Hydromol is a bath oil which helps to prevent dehydration of the skin in people with dry skin conditions such as eczema and dermatitis. A person may only be afflicted with the condition part of the time. Flare-ups can cause the symptoms to suddenly worsen or become more apparent. Regular use of moisturising bath oils can help the skin retain moisture. Hydromol contains light liquid paraffin and Isopropyl myristate. Light liquid paraffin is a natural mineral which fortifies the protective barrier on the skin which is responsible for retaining moisture. These ingredients help to replace the water which the skin loses, while fortifying the natural protective barrier of the skin to help lock in the moisture. To use Hydromol in the bath, add 1 to 3 capfuls to a 20cm bath of warm, but not hot, water. Bathe for between 10 to 15 minutes and use a sponge or flannel to cover your skin with the bath water. To use Hydromol in the shower, apply a small amount of Hydromol to a sponge or flannel and rub onto wet skin and rinse. Use a clean towel to pat your skin dry. Avoid rubbing as this can cause further irritation and possible make your dry skin worse. All medicines have the potential of causing side effects, though not everybody gets them. It's important to be aware of the associated risks and be vigilant if any develop. If you experience any of the side effects listed above, stop using Hydromol and speak to your doctor. Take extra care when bathing or showering with Hydromol as it can make surfaces very slippery. Hydromol contains liquid paraffin which is flammable. Towels, clothing, bedding and any other material which comes into contact with the emollient can be easily ignited by a naked flame or cigarette. Wash these materials regularly. Do not use Hydromol if you are allergic to any of the ingredients. Can I use Hydromol while pregnant or breastfeeding? It is generally regarded as safe to using Hydromol while pregnant and breastfeeding. Breastfeeding mothers should wash any residual emollient from their breast before feeding their child. What should I do if I forget to use Hydromol? If you forget to use Hydromol, don't worry and continue to use your emollient as normal. What if I use more Hydromol than I should? Using more Hydromol is unlikely to harm you. There is a risk it may cause side effects, though this is rare. Can I use hydromol bath and shower on my face? Hydromol is safe to use on all areas of your skin, however there is a risk of the emollient coming into contact with your eyes while washing the face. If you get any of the emollient in your eyes, rinse your eyes with warm water. Can I use other moisturising products with hydromol? It is not known how Hydromol might affect other treatments. As a precaution, wait 30 minutes between bathing with Hydromol and applying any moisturising products. Dosage: 1-3 capfuls to a 20cm bath of water, soak for 10-15 minutes. Or, apply to wet sponge or flannel and rub onto wet skin. Description: Hydromol is an emollient used to manage dry skin conditions such as psoriasis, eczema, ichthyosis and senile pruritus.